A cultivar of Prunus cerasus L. ‘Large, roundish, inclining to heart-shape. Skin dark red, becoming almost black the longer it hangs. Stalk an inch and a half to two inches long. Flesh purplish red, tender, juicy, and pleasantly sub-acid. Used for culinary purposes. July and August.’ [Hogg – Fruit Manual p.60/1860]. Produces a vigorous tree but tends to lose vigour with age. A good to very good quality cherry which ripens late and hangs well on the tree. Seldom cracks. First rate kitchen fruit. [Grubb]. ‘The Morello cherry, one of the most useful in our collections, is mentioned by Parkinson in 1629, who says it is so called from its juice being like that of the Morus or Mulberry. In a favourable situation it will ripen its fruit well on a standard, but the crop is precarious. On an espalier, where it has plenty of sun, it succeeds perfectly; and on a north wall it ripens well and bears abundantly; but in this situation its fruit is too austere to be eaten raw, and consequently it is generally used for the purpose of preserving in brandy. 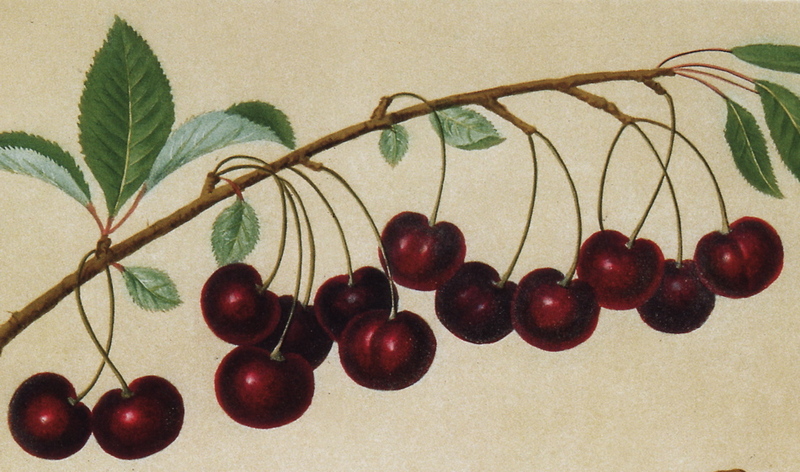 I would strongly recommend the Morello cherry to be planted against an east, south-east, or south wall, trained thinly, the branches at least six inches apart, not suffering them to be overloaded with fruit; which should be kept on the trees till it is perfectly ripe, or beginning to shrivel. It will then be found most excellent in the dessert. This is not the Cerisier très-fertile of Duhamel, nor do I find it in his collection. M. Noisette says he brought it to Paris from Brabant in 1807.’ [George Lindley – Orchard Guide p.147/1831]. Figured in Pomona Britannica PB pl.XIII/1812. An ancient variety. Listed only in the 1850 and 1857 catalogues [Cherry no.9/1850]. Macarthur originally obtained the Morello cherry from J. Bailey, nurseryman of Adelaide, who acted as his agent in the new colony. This introduction possibly failed. Macarthur to John Bailey, 28th September 1844. However Macarthur sold 8 morello Cherry trees to Bailey later on.